I’ve been cranking this tune on the “Abbey Road” CD all weekend because spring has finally come to the Midwest. Actually, it feels more like summer, with abundant sunshine and temperatures in the mid- seventies. A mere week ago we had sleet and wet snowflakes falling, so this weekend feels like a miracle. I could not bring myself to spend much time indoors this weekend. In fact, I opted to spend this afternoon hanging out at the park with my niece and nephew rather than enter the darkness of a movie theatre. So I’m postponing my viewings of “The Visitor” and, possibly “In Bruges” (on the lone screen where it’s still playing) for later this week. I did manage to make a small dent in the DVR queue this weekend, and the film I caught was anything but a sunny harbinger of happy summer frolics. 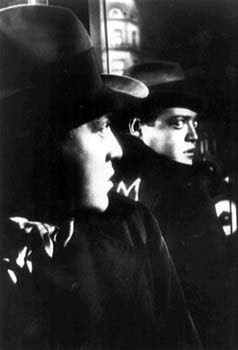 Rather, I watched Fritz Lang’s classic thriller “M” for the first time. Made in Germany in 1931, “M” details the search for and capture of a child murderer, played with a convincing (if somewhat overheated) touch of madness by Peter Lorre. What follows are some of my uneducated impressions of the film. Given how long ago it was made, “M” must have been groundbreaking in the techniques it uses to create tension and mood and to suggest violence without actually showing it. Some of the images used to telegraph offscreen mayhem are still as disturbing and devastating to watch as they must been in 1931. Early in the film for example, we see Lorre approach a little girl – but we don’t initially see his face, only his shadow falling on a “Wanted” poster for the child killer. We then see him buying the child a balloon doll which wears a little dress not unlike the child’s own. Later, when the girl fails to come home for dinner, her mother shouts for her as Lang cuts to shots of an empty stairwell, an empty courtyard, the street beyond, and then finally to a shot of the balloon doll hopelessly tangled in some telephone wires. It’s a simple but chilling progression of images that builds to an almost unbearable climax. And that’s just in the first 5 minutes. Lang creates a atmosphere of suspicion and paranoia fairly effectively in the scenes that follow, even though Lorre drops out of sight for a good while. We see an innocent gentleman beset by an angry mob simply because he talks to a young girl and asks where she lives; police intervention saves him from their wrath. There are also some good bits of slightly dark humor (in a vein similar to what we would later see in Alfred Hitchcock’s work), particularly in a scene with Lorre’s sweet but hard-of-hearing landlady. But Lang also serves up some endlessly ‘talky’ scenes in which the police or the local crime syndicate (whose activities have become less profitable given the police’s unrelenting scrutiny of the neighborhood) discuss and debate how to catch the murderer. My thoughts during these scenes: tell me less, show me more. I’m not bright enough to know whether these extended philosophical debates were meant to illuminate Wiemar Republic-era thoughts on crime and law enforcement; I had the distinct feeling that they were filled with subtle political messages that were flying right over my head. And I kept wishing they’d get back to Peter Lorre so we could see what he was up to now. The penultimate scene has Lorre captured and interrogated by an angry mob. And another talky debate ensues. Lorre, eyes bulging and his voice bordering on screams, begs for mercy on the grounds of his insanity, his utter inability to control his need to commit crimes and his disassociation from the actual act when in the midst of it. I had the sense that this sort of psychological defense was modern, even revolutionary, for the times in which “M” was filmed. And I didn’t quite know what to make of the final shot in which a trio of grieving mothers in black veils sit together in a courtroom with one intoning: “”And if they take his life? Will that bring our babies back to us?” followed by a black screen and the mother telling us in voice over that “we must all watch over our children.” The ending deprives us of any sense of resolution or any reassurance that good triumphs over evil. This might be a bit of a reach, but as I write about it now, I keep thinking about “No Country for Old Men,” and its similarly ambiguous and its anything-but-reassuring finale. And in that light, “M,” feels as unsettling and contemporary as this year’s thrillers. In fact, Pat, the movie has been read as an indictment of capital punishment:”If execution didn’t bring the children back and if execution fails to solve this ongoing social issue then neither retribution, nor reform, as types of punishment are suitable for dealing with those with mental illness.”There’s a very complete and nuanced discussion of the film at Kinoeye: http://blogs.warwick.ac.uk/michaelwalford/entry/fritz_langs_m/I can’t help but see parallels with the society Lang portrayed and the one America is now convulsing through. Marilyn – Thanks for the link, I’ll be interested to read that.I did see the parallels between the society in “M” and our post-9/11 society, particularly with regard to the paranoia and widespread suspicion that overtakes the citizens while the murderer is at large. That felt pretty familiar.